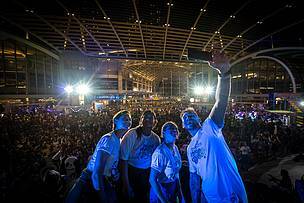 1 APRIL 2019, SINGAPORE – Organised by the World Wide Fund for Nature (WWF), Earth Hour 2019 brought 40,000 people together in a joint effort for sustainable lifestyles. As the first zero waste Earth Hour in Singapore, measures were put in place to reduce disposables, saving festival-goers thousands of plastic bottles and single-use items. The three-day Earth Hour Festival For Nature was built entirely on principles of reusability. This resulted in 3,500 plastic bottles saved with the use of water stations, and 10,000 reusable plates and bowls replacing single-use, disposable items. Food waste was collected for composting, and materials used in the physical set up will be reused. With the planet facing a biodiversity crisis caused by over-production and consumption of resources, Earth Hour invited people in Singapore to be part of a bigger global conversation about the role they play in restoring nature. WWF Panda Ambassador Liv Lo, as well as Earth hour Ambassadors Charmaine Yee, Paul Foster and Preetipls lent their voices to the movement, while activities and marketplaces encouraged festival goers to become conscious citizens. “The world has lost 60% of biodiversity, bringing us to a turning point where we either act to restore nature, or risk losing our crucial resources. With 40,000 people going zero waste, Earth Hour has shown that change is possible. If people in Singapore can take the movement beyond the festival and into their daily lives, imagine what this could do for some of the world’s biggest environmental challenges” said Kim Stengert, Chief of Strategic Communications and External Relations at WWF-Singapore. The world’s largest grassroots movement for the environment, Earth Hour took place around the globe on 30 March 2019. Individuals, businesses and cities in 188 countries and territories spoke up for nature and urgent action for the environment. The hashtags, #EarthHour and #Connect2Earth, trended in 26 countries and generated over 2 billion impressions. To ensure environmental action beyond Earth Hour, WWF has launched a 7-day Conscious Citizen Challenge in Singapore to encourage people to make sustainable choices with plastic, paper, fashion and food. (Website: bit.ly/wwf7day). Earth Hour 2019 is supported by the following zero-waste partners: Citizen Farm, ELO, HF/DF, Revolv, Shinpuru, Triple Eyelid and XCEL Industrial Supplies. It is also supported by the following event partners: Buro, ES Power, Fave Pay, FitSphere, Kiss92 FM, LIDL Singapore, Love Nature, Marina Bay Sands, Samsonite, Sky Premium, StarHub, Takashimaya Department Store, The Fashion Pulpit and Wing Tai Retail. Earth Hour is WWF's global environmental movement. Born in Sydney in 2007, Earth Hour has grown to become the world's largest grassroots movement for the environment, inspiring individuals, communities, businesses and organizations in more than 180 countries and territories to take tangible climate action for over a decade. More recently, Earth Hour has focused on raising awareness and inspiring conversations on why nature matters. The movement recognizes the role of individuals in creating solutions to the planet’s most pressing environmental challenges and harnesses the collective power of its millions of supporters to build a sustainable future for all.